The reference to "Bank Notes" in no way infers that any of the notes in this publication have been produced by an Issuing Bank. It would be completely wrong to infer this in any way. 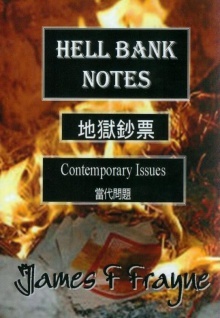 These notes are faux notes, as such they are not an officially recognized currency or legal tender since their sole intended purpose is to be offered as burnt-offerings to the deceased as often practiced by the Chinese and several East Asia cultures, their specific purpose being to be burnt in strict accordance with Taoist Tradition. They therefore more rightly belong to the category of 'Exonumia' under the branch of Fantasy notes. Even so, because of their strong underlying tradition and the symbolism contained within most of them, they remain of great interest. Diese Seite wurde zuletzt am 16. Dezember 2018 um 11:34 Uhr bearbeitet.